Partial-update adaptive signal processing algorithms not only permit significant complexity reduction in adaptive filter implementations, but can also improve adaptive filter performance in telecommunications applications. 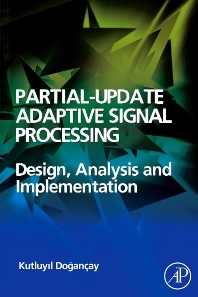 This book gives state-of-the-art methods for the design and development of partial-update adaptive signal processing algorithms for use in systems development. Partial-Update Adaptive Signal Processing provides a comprehensive coverage of key partial updating schemes, giving detailed information on the theory and applications of acoustic and network echo cancellation, channel equalization and multiuser detection. It also examines convergence and stability issues for partial update algorithms, providing detailed complexity analysis and a unifying treatment of partial-update techniques. This unique reference will be of interest to signal processing and communications engineers, researchers, R&D engineers and graduate students. Kutluyil Dogançay is an associate professor of Electrical Engineering at the University of South Australia. His research interests span statistical and adaptive signal processing and he serves as a consultant to defence and private industry. He was the Signal Processing and Communications Program Chair of IDC Conference 2007, and is currently chair of the IEEE South Australia Communications and Signal Processing Chapter. Signal processing systems engineers,R&D engineers,university applied researchers and postgraduate students. Kutluyıl Doğançay received the BS degree with honors in electrical and electronic engineering from Boğaziçi University, Istanbul, Turkey, in 1989, the MSc degree in communications and signal processing from Imperial College, The University of London, UK, in 1992, and the PhD degree in telecommunications engineering from The Australian National University, Canberra, ACT, Australia, in 1996. Since November 1999, he has been with the School of Engineering, University of South Australia, where he is a professor and discipline leader of electrical and mechatronic engineering. His research interests span statistical and adaptive signal processing with applications in defence and communication systems. Dr Doğançay received the Best Researcher Award of School of Engineering, University of South Australia, in 2015, and Tall Poppy Science Award of the Australian Institute of Political Science in 2005. He was the Tutorials Chair of the IEEE Statistical Signal Processing Workshop (SSP 2014), and the Signal Processing and Communications Program Chair of the 2007 Information, Decision and Control Conference. He serves on the Editorial Board of Signal Processing and the EURASIP Journal on Advances in Signal Processing. From 2009-2015 he was an elected member of the Signal Processing Theory and Methods (SPTM) Technical Committee of the IEEE Signal Processing Society. He is currently an associate member of the Sensor Array and Multichannel (SAM) Technical Committee and a member of the IEEE ComSoc Signal Processing for Communications and Electronics Technical Committee. Dr Doğançay is the EURASIP liaison for Australia.